Increasing My EOS Security With Ledger!steemCreated with Sketch. You guy probably know how security and privacy crazy I am, especially when it comes to cryptos... Just one wrong move, one wrong link, one misclick, and your cryptos are done, you will never see them again! Yup, this is the hard truth of cryptos, one wrong click and you can lose hundreds, thousands, millions! There are so many scams going around, phishing for your keys, for your passwords, for your passphrase, so many! And people seem to not care too much about this. 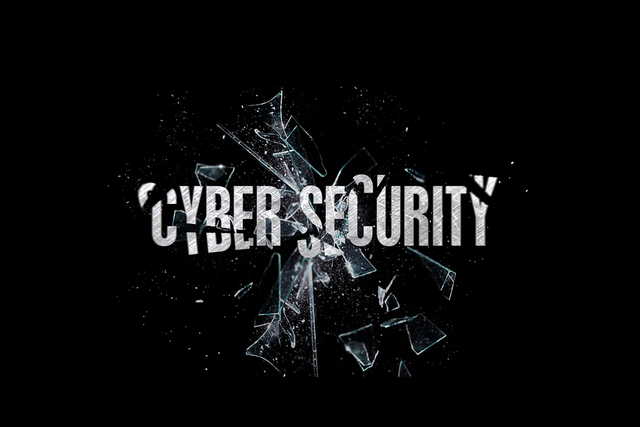 They leave their passwords on folders called "CryptoPasswords" right on the desktop, just waiting for a trojan to access it and steal all the content inside...Or just as bad, they leave their whole portfolios on exchanges! People remember - "Not your keys? Not your crypto" it's the first crypto rule! 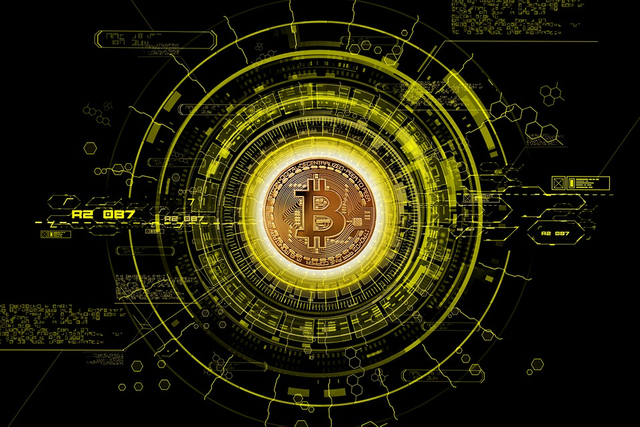 BTC was created as a way to make you your own bank, you are responsible for your own money, if you get scammed it's your fault, if someone accesses your computer, it's your fault, if an exchange or crypto makes an exit scam it's your fault! If you don't take the necessary measures to secure your cryptocurrency you are the one to blame. Are exchanges safe? Well, MountGox and Quadrigacx... do I need to say anything else? Exchanges aren't safe, maybe some are safer than others for example, I trust Coinbase and Binance, still, I would never keep my money on those exchanges, they are not banks... they are exchanges! Only keep on exchanges a small amount of money to trade with. The best way to keep your cryptos safe? Paper wallets are pretty secure, but I would go with a hardware wallet like Ledger and Trezor, these two are the best around, they even help each other. And between these two I would go for Ledger, Ledger has a much bigger community and support and adopts all the cryptos much faster then Trezor. But why am I talking about all this stuff? This is common knowledge nowadays... or at least I hope it is. Well, I'm talking about security and privacy because I spent the whole day changing my EOS account's keys to the ledger keys! Crypto isn't easy at all, and EOS made me sure of that. To transfer the EOS ERC20 tokens to the EOS mainnet we had to go through a very complicated process and shady websites to make our keys and associate them with the ETH wallet. We had to make Eth transactions and everything, it wasn't easy at all! I managed to do it, but many weren't able, and others lost their whole EOS in the process because of scams. 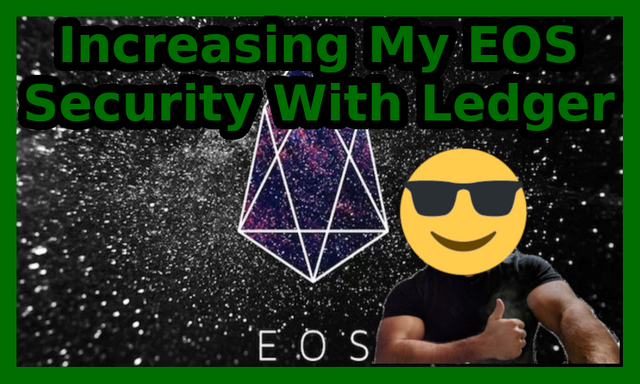 The fact that I had to go through some shady websites to make the keys always made me doubt how safe my EOS account is... but not anymore! Today I changed my account's permissions to my ledger wallet keys. Well, as you might know, I'm now a Linux user, and this didn't make it any easier! 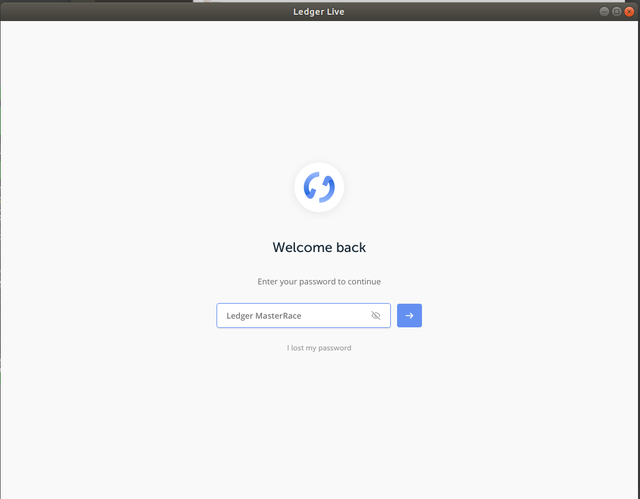 To start, I had to get Ledger Live from their website to install and uninstall wallets on the ledger. This part wasn't hard, I got the .appimage from their main website. I opened the app and connected my ledger, and the problems started straight away... It seems that on Linux I had to create a set of udev rules to allow device access. For more information about how to add these rules go to the ledger's main website and search for connection issues on linux . Was it working now? Well, no... By this point I was starting to doubt myself, did I do a mistake by changing to Linux? This was all working fine before...But then something clicked! Wait a minute... maybe it's the Linux firewall that I enabled! One click was all that I needed to make it work. Now that I had the ledger live on Ubuntu I just had to install the EOS wallet on ledger, or should I say the massive EOS wallet. What the hell did developers put inside this wallet it's so big, I had to uninstall all the other wallets to install this one, this is probably the biggest wallet that I've ever seen! 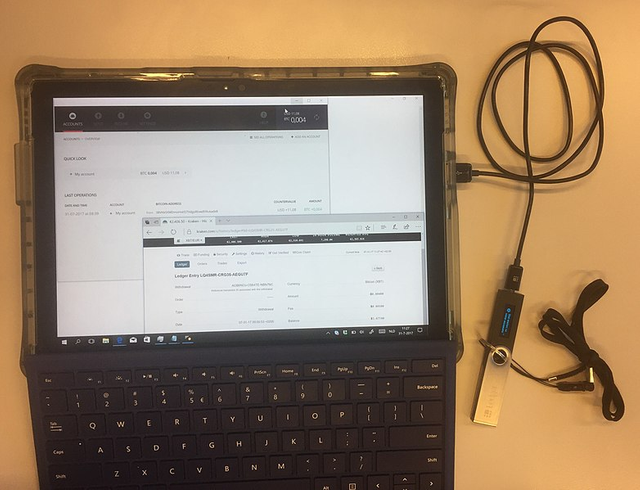 With the EOS wallet installed on Ledger I needed the public key, mainly because it's the public key that it's used to change permissions from one set of keys to another set of keys, in this case, the set of keys store inside the ledger wallet. To do this I had to install the Fairy Wallet from their github. I had never used the Fairy Wallet, but it was easy to understand. The problems came when the Fairy Wallet couldn't access the EOS keys inside the ledger... Again another problem! Cryptos aren't easy at all. After this whole thing, I connected it to the Sweden node (https://api.eossweden.se – by EOS Sweden) and got the public key, the public key is what is used to change the account permissions to the Active and owner's keys inside the EOS ledger wallet. What now? Where do I change permissions? Easy... on the greymass wallet! So, many wallets! Guess what? All this work was for nothing... It seems the greymass wallet has an option to change the keys to the ledger one automatically! Just by going to "tools", "manage wallets" and clicking on the three dots... One whole day wasted. Oh well, at least now I'm safer. Anyone that still has the original keys from the scammy looking websites should do this, even though nothing happened so far you never know. Better be safe than sorry. I don't know how Cypherglass isn't a top5 Block producer... Finch is one of the best at providing information. Images Free Source - 1, 2,3,4,5,6, 7, 8, 9, 10, 11, 12, 13, 14, 15, 16, 17, 18, 19, 20, 21, 22, 23, 24, 25, 26, 27 - Tradingview snapshots too. Question of the day: Are you still using your original keys given by scammy looking websites? I was so disgusted with the Eos caper to get the actual tokens. I mean how in the heck can anyone ever expect normies to get into crypto of those are the kind of hoops that have to be jumped through?! 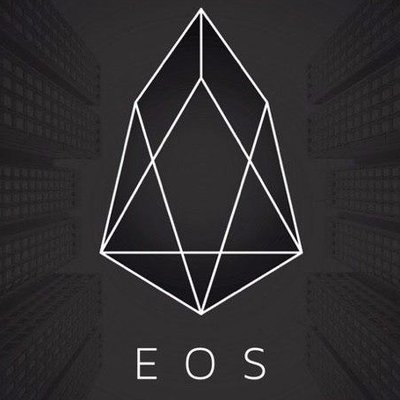 There were so many people that lost their EOS because of converting scams! They could have made the conversion much easier. One of my other cryptos also released their mainnet around the same time and their conversion was really simple and easy, I think no one lost their bags and there are still ways to convert to the mainnet if anyone forgot to do it. Hardware wallets are the best, I'm in love with me ledger, the only reason I don't sleep with it it's because I'm afraid to break it mid sleep... It has support for so many coins! This post had received 5.00% upvote from @steemitportugal account! Congratulations! This post has been upvoted from the communal account, @minnowsupport, by Teutonium from the Minnow Support Project. It's a witness project run by aggroed, ausbitbank, teamsteem, someguy123, neoxian, followbtcnews, and netuoso. The goal is to help Steemit grow by supporting Minnows. Please find us at the Peace, Abundance, and Liberty Network (PALnet) Discord Channel. It's a completely public and open space to all members of the Steemit community who voluntarily choose to be there. It took me months to move my EOS over as well but was happy with the Fairy Wallet! Don’t forget to cast your votes for BPs! Already did, I'm changing votes all the time on EOS, just a few weeks ago I unvoted eos.games because they forgot to update their blacklist on the node and allowed an hack to go trough... Huobi was able to catch it before a % of the EOS was sold on huobi. I don't like exchange BP but huobi got my vote because of this. I have some EOS on Binance, and don't want it there. I also have a Ledger but EOS is not supported in the Ledger Live app. I did make a half hearted attempt at the Fairy Wallet.. but its all so bloody cumbersome. It isn't? I was able to put it on my ledger, there is an EOS wallet in there now. Try to do it with the greymass wallet, it's really easy, just follow the steps on that gif, I wish I knew before I did all this stuff with the Fairy Wallet, especially since someone just told me that the fairy wallets isn't being updated that much. I will have another go, I have some Stellar on there too.. I don't like keeping coins on exchanges. I had some on Cryptopia.. look what happened to that. I never keep coins on exchanges... I have some money on coinbase though, but I guess money is different then cryptos, losing money from an account would be easier to explain and prove in court. BTW, if you have stellar I hope you are in a pool to earn the 1% inflation, last time I checked Reddit had a nice pool going that gave people almost all the % they deserved. That is a good idea, try to accumulate STEEM too, these two are going to be powerhouses in the future! So true... but I guess that's normal, especial in a crypto like EOS that is still new and being developed. Damn... That's bad luck, most of my tokens are still worth a little more than 0, but I trust in my token choice to be worth a lot more in the future, I did enough research into them to know that they are legit and have people supporting them.